The first movie with Jack Ryan, Tom Clancy’s put-upon CIA agent, is still the best in that series. The Hunt for Red October came out in March 1990, it made a killing at the box office, and then it quietly disappeared from most people’s radars. I know it’s not exactly the most obscure movie I’ve talked about in my Forgotten Film Gems section, but I still feel like it deserves a spot on here because it’s so good yet frequently overlooked. You don’t usually hear it mentioned among the best thrillers ever made. It occupies the middle ground between good and amazing that somehow precludes it from getting the praise it deserves. So let’s pull a Crazy Ivan and see if we can spot what makes The Hunt for Red October a stealthy, stellar film. First, I’ll explain my history with this movie and what it’s about. When I was a kid I heard about other kids reading The Chronicles of Narnia and A Wrinkle in Time, but my favorite books were written by Michael Crichton, Ray Bradbury, Arthur C. Clarke, Robin Cook, John Grisham, and Tom Clancy, among others. I loved the technical jargon and grownup situations the characters found themselves in. My favorite Tom Clancy book is The Cardinal of the Kremlin, which would be impossible to make into a film now because it’s such a product of the Cold War. But The Hunt for Red October was the first of his I read, probably because it’s the shortest. So I have a special place in my heart for it. In 1990, Hollywood took notice of how popular Clancy’s books were and decided to turn The Hunt for Red October into a film. The timing was perfect. The Soviet Union was in the process of falling apart, so if that film had been made any later it wouldn’t have worked. Plus, actors Sean Connery, Alec Baldwin, Sam Neill, Tim Curry, and James Earl Jones were all rising stars at that time and they were perfectly cast in their roles. Baldwin, especially, embodies the character of Jack Ryan better than any actor since, in my opinion. He’s resilient and smart, but he also looks out of place and awkward most of the time. 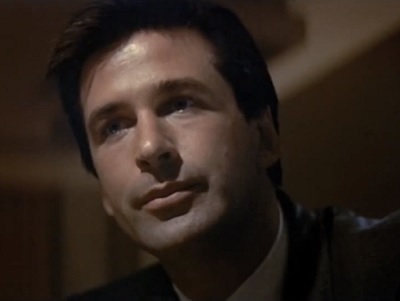 No other actor captured those qualities of the character quite as well as Alec Baldwin. 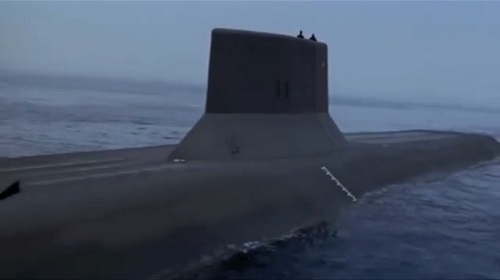 The film is about a new Soviet submarine called the Red October, which has an advanced propulsion system that allows it to be virtually undetectable on sonar. The captain of Red October, Marko Ramius, and his officers are attempting to defect to the United States, but no one in the U.S. knows their intentions. However, a lowly CIA analyst named Jack Ryan correctly guesses Ramius’ intentions and spends the whole film trying to get naval and governmental officials to believe him. He eventually succeeds, and Red October and its crew members are safely taken into American custody. This just scratches the surface of what makes this movie stand out as an action film and a character study. There’s actually very little action until the end. The movie does a wonderful job building suspense without relying on gratuitous action and special effects. Most of it is driven by complex characters and scary situations. I’ll try to explain why this movie works so well in the rest of this review. Director John McTiernan passed up the opportunity to make the sequel to his classic action film Die Hard to make this movie. What other reason do you need to see how great this film is? The main character hates flying, and he is forced to confront his fear over the course of the film. He starts the film at an airport. No one in authority believes him at first. He has to crawl through a tight space during an action sequence. He buys a teddy bear for his daughter. There’s someone on board the submarine/inside the building that the conspirers hadn’t planned on (the cook/John McClane). There aren’t enough similarities to do a full Movie Matchup, but it’s interesting to note that McTiernan was in familiar territory bringing The Hunt for Red October to life. He was also at the top of his game at the time, having made two perfect action films just before this one. His career went mostly downhill in the ensuing years, with the exception of Die Hard with a Vengeance. It’s sort of melancholy to watch this movie knowing that it was one of his last hurrahs. I’m astounded by the performances in this movie. Alec Baldwin, Sean Connery, Tim Curry, and all the other members of the cast are extremely restrained in their acting. And that’s a very good thing. Just like with the story, there’s a lot going on beneath the surface. Jack Ryan is struggling to keep calm during intense situations, and he also has the unenviable task of convincing others of his hunches with little or no proof to back him up. Marko Ramius is trying to be stoic and confident for his fellow Soviet defectors and keep the rest of his crew from discovering the truth about their mission. And Tim Curry is, well, unbelievably tame compared to just about any of his other performances. Seeing all of these actors keeping their emotions subdued adds to the pressure until they make it through the ordeal and they can finally breathe a sigh of relief. Jack Ryan is always in over his head. That’s a big part of the charm of his character. He’s the everyman who would much rather be at home with his family than out putting his life on the line engaging in counterespionage. But he does what he has to do and he never backs down from a fight, even when it seems hopeless. The Hunt for Red October captured Ryan’s plight better than Patriot Games, Clear and Present Danger, and The Sum of All Fears. In Patriot Games, he rejoins the CIA in order to battle a vengeful Irish revolutionary. In Clear and Present Danger, he’s in the dark about a secret black-ops mission, and he has to unravel corruption at the highest levels of government. In The Sum of All Fears, it’s a race against the clock to prevent all-out nuclear war. But in The Hunt for Red October, Ryan is just an analyst who writes books for a living and it’s with great reluctance that he steps up and saves the day. 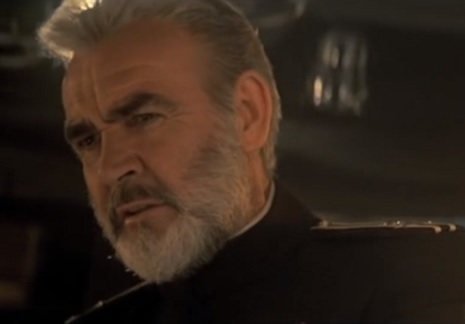 The moment that sets this movie apart for me is when Ryan is on the Red October and following Captain Ramius’ seemingly suicidal instructions to head toward an oncoming torpedo. As they wait for the impact, Ramius calmly asks about the books Ryan has written. When Ryan tells him, Ramius reacts in disgust, saying that Ryan got everything wrong in one of his books. That exchange during a tense situation nails those two characters and serves as a perfect juxtaposition. Ryan has asked so many people to take his word throughout the film, and he’s insulted quite a few people along the way with his bluntness. Suddenly the tables are turned and he has to take Ramius’ word completely on faith and deal with being insulted by him. And right when it seems like everything is going to explode in his face, a miracle happens and the person asking for a leap of faith is completely vindicated. This level of clever storytelling isn’t to be found in the other Jack Ryan films. They’re all good; don’t get me wrong. Patriot Games comes the closest to matching The Hunt for Red October’s intensity and intelligence. But even it falls into the trap of trying to one-up itself until it reaches a finale that couldn’t possibly live up to expectations. For me, the original will always be the best. Maybe it’s that The Hunt for Red October reminds me so much of The Abyss, but for whatever reason it will be tough to beat this movie as one of the best submarine movies ever made. It’s right behind Das Boot and 20,000 Leagues Under the Sea (1954). Accept no substitutes for this absolute film gem. This entry was posted in Forgotten Film Gems and tagged action movies, cold war, die hard, films, fun, funny, hunt for red october, john mctiernan, movie review, movies, movies based on books, puns, tom clancy. Bookmark the permalink. Nice review, but I wonder why you didn’t leave the ending for the readers to discover on their own. Sorry about that. I tend to get overzealous in my discussions of films and my enthusiasm leads to major spoilers. I’m glad you liked the review despite that. because the film has been out over twenty years? I think my favorite part is when Baldwin repeats Connery “most things in there don’t react well to bullets”. I totally agree. He does a pretty amazing impression of Connery, too.